You can expect a response within seven working days. If a response is likely to take longer than seven days, you’ll be contacted with a revised time frame. Alternatively, freecall 1800 800 007, by online feedback form at http://feedback.ptv.vic.gov.au/feedback_2.aspx, or in writing to: Customer Advocate, Public Transport Victoria, PO Box 4724, Melbourne Vic 3001. Please ensure that you provide your case reference number for administrative purposes. Further details are available at www.ptv.vic.gov.au. 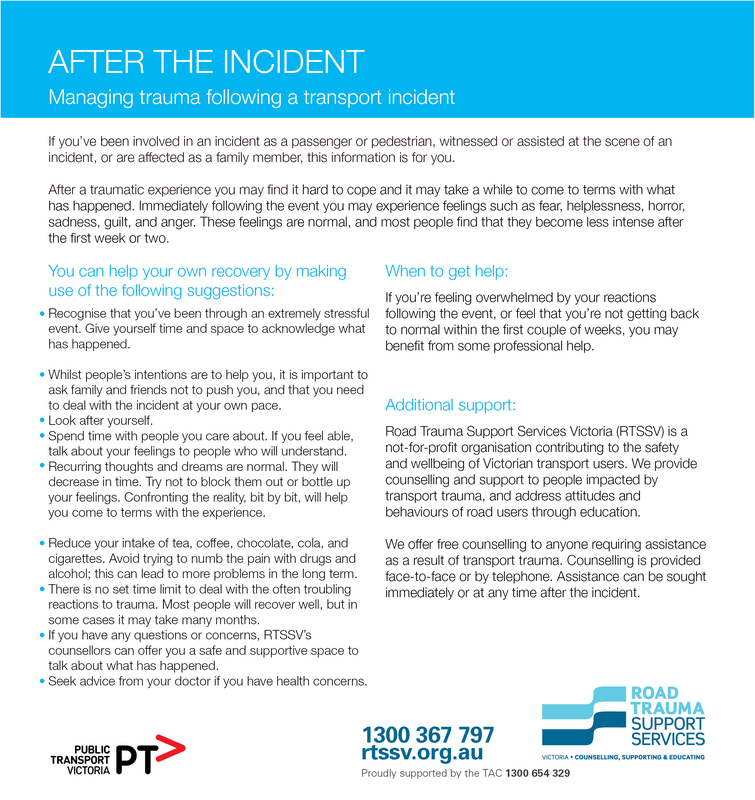 If you’ve been involved in an incident as a passenger or pedestrian, witnessed or assisted at the scene of an incident, or are affected as a family member, click here for further information. If you’ve accidently lost something while travelling with us, contact our Lost Property office and we’ll do everything we can to find it and return it. Call +61 3 9610 7512 between 8am to 5pm weekdays. If you’re a supplier, contractor or business partner, contact Metro HQ for all business enquiries. You can find more information on doing business with Metro here. If you require access to Metro’s Rail Network, you can find out more information about this at our Metro Site Access section of our website. If you’re looking for a job with Metro, visit the Careers section of our website and search for current vacancies or set up a Job Alert which will notify you of any jobs which might be of interest. Interested in filming or photographing inside a Metro station? Find out all you need to know about Filming and Photography at stations. Detailed public transport information is available on the Public Transport Victoria and Transport for Victoria websites. Metro is unable to facilitate media or information requests from students. Click here to download the Metro Environment & Sustainability Policy. The Metro Community Education Unit (CEU) proactively engages with schools and community groups to teach and promote safe train travel. Their objective is to proactively engage school groups to advise on safe utilisation of public transport and the expected standards of behaviour. Click here for more details and to find out how to secure a presentation. In compliance to the Electricity Safety Act, Metro’s Bushfire Mitigation Plan and Electrical Line Clearance Plans are available on request. Click here to download the Metro Bushfire Mitigation Plan 2018-21. Click here to download the Metro Electric Line Clearance Plan 2017-20.